If you needed another reason to hate the MAGA turds, how about the fact that you now can't dislike something without being unfairly lumped in with them? If you think Last Jedi relied too heavily on silly humor, you can't even express that opinion without self-important jerks assuming you're one of those Gamergate washouts who decided to harass Kelly Marie Tran for daring to not be white. So not only are those pantloads trying to ruin things for people who did like them, they're even ruining not liking things! See, this is why none of them have friends. Kylo Ren was, in The Force Awakens, a kind of villain we don't often see: one who is striving, who is stuggling, to be evil. We don't know why he idolizes his grandfather so much, but it's clear he does and that it's tough for him to live up to the legacy he imagines. The Last Jedi is at once more sympathetic to him - showing the event that led him to (understandably) eschew the Jedi way - and less, painting him as a petulant child who throws a tantrum the first time he doesn't get his own way. And when he's contrasted with Rey, the movie's message is clear: just because bad things happened in your past, it doesn't excuse your bad decisions in the present; it's your responsibility to rise above and be better than anyone expected. You can either use your power to help or to hurt, and only one of those choices is correct. No wonder so many unsavory types are mad at it. It seems that Kylo has changed his outfit since the first movie - and no, we're not talking minor, invisible changes like Darth Vader underwent through his trilogy, but actual changes. He's still wearing black boots and pants, of course, but his tunic/housecoat thing is shorter, reaching only to mid-thigh instead of falling below the knees. And instead of being patterned with horizontal ribs all the way up, it's now got more of a waffle pattern. Also, he no longer wears a second robe over it. He's traded his hooded cape in for a simpler shawl, and on the normal release of this figure, that's done as a plastic piece that slips onto the toy's shoulders; but this is an exclusive, and like other exclusives, it gets softgoods. 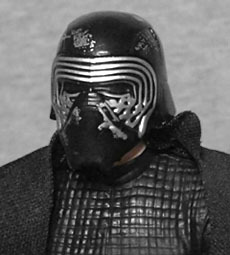 Although there was an unmasked Kylo Ren in the Force Awakens line (first available at SDCC and later with fewer accessories at mass retail), this one's face is a different sculpt. It doesn't look much like Adam Driver, but it does look like Kylo Ren, if that makes sense. While the mass figure has this same sculpt, it doesn't have dark circles under the eyes or red paint on his scar. Thus, it looks better here. We should have known how radical Rian Johnson's plan for Last Jedi was going to be when, in Snoke's first scene, he immediately tells Kylo Ren to quit with his low-rent Darth Vader cosplay. It's like a meta-commentary on Episode VII just sticking with the formula and not trying anything new. This figure includes the helmet, done as a second head - and for some reason, cast from metal. The part that plugs onto the toy's neck is still plastic, and it's held to the metal cap with a screw. The helmet is painted with lots of silver scrapes, which is probably meant to represent the damage from Kylo smashing it in the elevator, but that didn't just scratch up the surface, it turned the dang thing into shards! 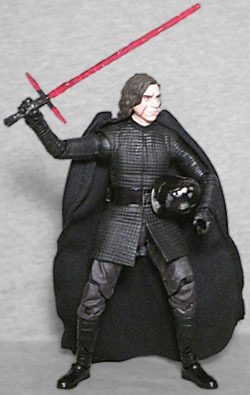 The figure also comes with the ignited and unignited lightsabers, because some things don't change. It's hard to believe Hasbro once thought they could make a removable blade for his weird lightsaber, isn't it? The powered-down hilt can plug into a slot on his belt, so he doesn't have to hold it all day long. The articulation is par for the Black Series line, with joints at the ankles, knees, thighs, hips, waist, wrists, elbows, shoulders, neck and head. The softgoods cape means he's still entirely poseable while he's wearing it (though since it doesn't attach in any way, just hanging on his shoulders, it's liable to fall off; you can use his hair to help hold it). As mentioned, this figure is a store exclusive - Walmart, specifically - and in addition to the softgoods and metal (two ends of the hardness spectrum when it comes to toys), it also includes a bit of a diorama base. 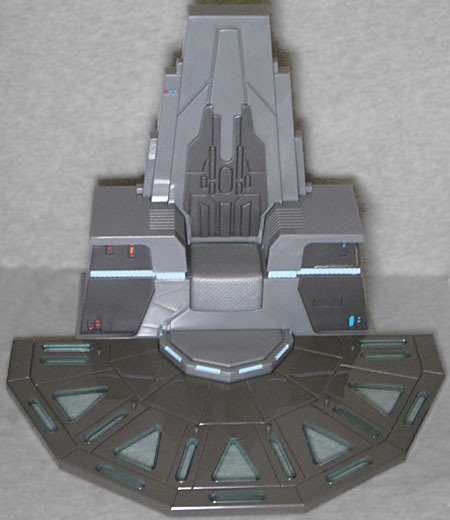 The piece in this set is a little different from others we've looked at, because it's not a standalone piece: he gets three bits of flooring that are designed to go around Snoke's throne, and serve no other purpose. If you didn't get Snoke ["half off, Coral!" --ed.] at GameStop, Kylo's base will be useless for you. How... very odd. The floor does look like this in the movie, though there it angles upward a bit, creating a dais. The three pieces fit together to form a half-circle that fits perfectly around the footrest of the throne, and the "hollow" sections are translucent blue plastic. 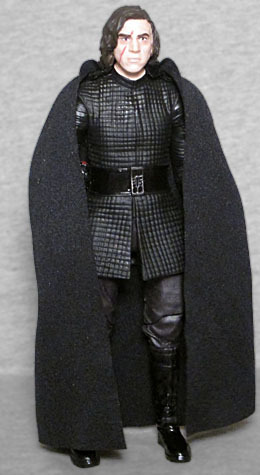 As far as exclusive variants go, Throne Room Kylo Ren isn't bad - the face is better than the regular release, the softgoods cape works, and the metal helmet is... heavy? The floor may not be too impressive, but the rest of the toy is. 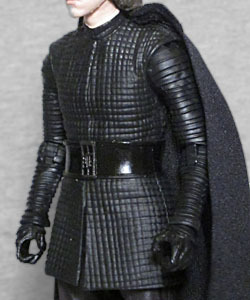 Now, given that Force Awakens started us out with a normal Kylo Ren figure before giving as an unmasked version, what are the odds that Last Jedi is starting us out with unmasked Kylo before giving us a Ben Swolo?